Size: 5.5" x 2.8" x 1.4"
This close relative of the TI-1250 was sold under different names from the distributing company Western Auto. Most common names are "electronic Wizard" or "M4987" but later it got the confusing "Citation" namepleate, too. The only difference to the TI-1250 are the wooden foil over the keyplate and the missing TI logo. View a TI-1025 based calculator with the same wooden foil. 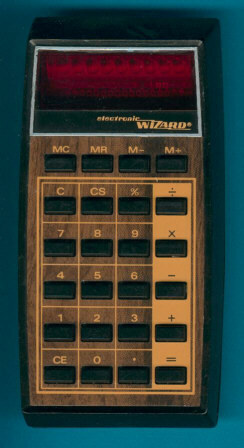 With the M4986 a similar calculator without memory but three different nameplates was sold. © Joerg Woerner, January 4, 2002. No reprints without written permission.